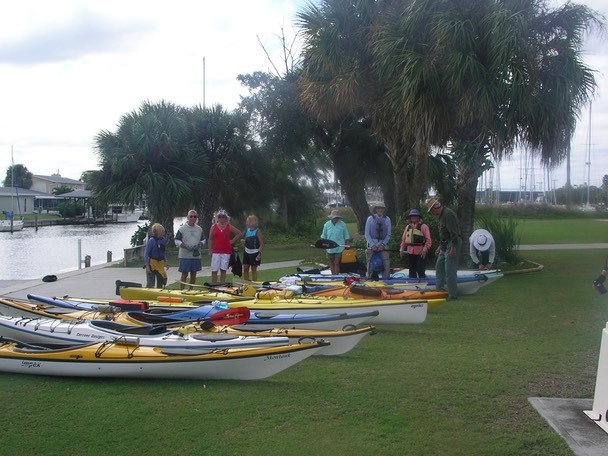 Every year, canoe and kayak clubs from around Florida hold a Paddler’s Rendezvous. 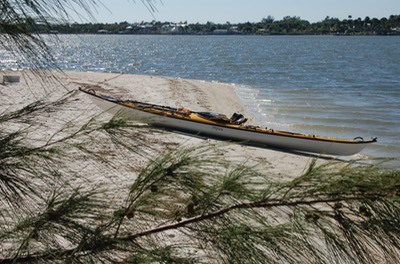 (Click here to see Paddler’s Rendezvous history) This years event was held on the third weekend in October in Titusville, near the Kennedy Space Center. 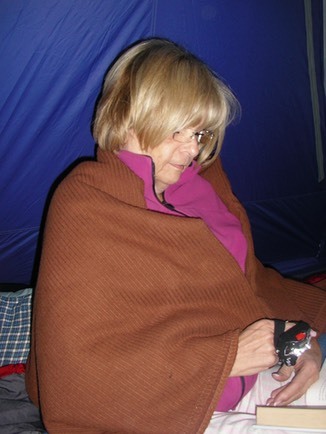 The venue was Brevard County’s lovely Manatee Hammock Campground, with several day trips planned on Friday, Saturday and Sunday, a pot-luck dinner on Saturday night and two great authors who talked about their recent books. 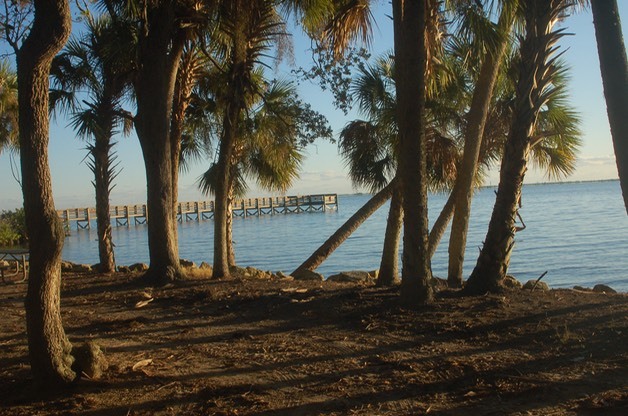 The campground sits just across the Indian River from the Space Center. 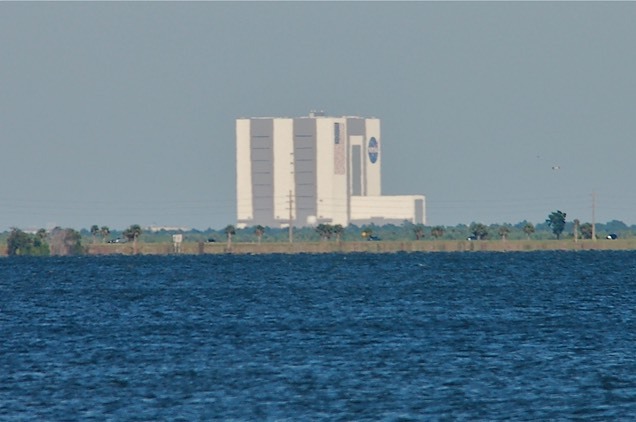 I was very excited to clearly see the Vehicle Assembly Building (VAB) where the moon rockets and space shuttles were assembled for take-off. Lisa and I are still new to Florida. 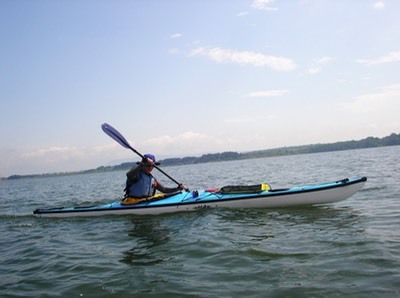 We don’t belong to any kayaking clubs yet and we don’t know many paddlers. We went to the Rendezvous in the hope of making some contacts and identifying clubs we might want to join. I find attending these kinds of things cold, hard to do. Most folks are already in clubs and come with a cohort of people they want to spend time with. People are friendly and helpful, but I still come away feeling like an outsider of sorts. Thank god for Lisa. She wades right into groups and meets people. If not for her, I probably would not have come away with nearly as much information as I did. Before going on to the trip reports I want to comment on the two authors who spoke. The first was Dianne Marcum, an author and Space Coast historian. She gave a fascinating talk on the early history of the Space Coast and Brevard County. The second author was Warren Richey. 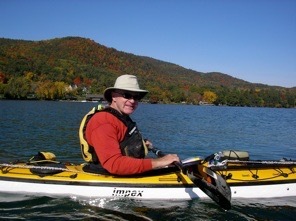 Warren participated in the 2005 Florida Circumnavigation Race 9See Water Tribe Adventures)and wrote a book about his adventures and trial, both internal and external. How, you might ask, can you circumnavigate Florida – a peninsula? The jaw dropping answer is by putting your fully loaded boat on wheels and towing it using just your body, overland for forty miles between rivers in northern Florida! It’s a great yarn told with humor sprinkled with painful feelings about a recent divorce. The book is Without A Paddle. I bought it and think it’s a good read. Look for it in an Adventure Book Review on this site sometime soon. 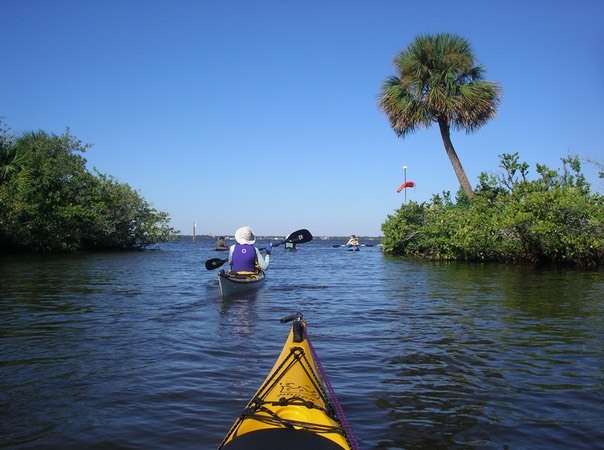 MANATEE COVE PARK: Directions - Our first trip (Friday) was at Manatee Cove Park. To get there from the campground, head south on US 1, turn left at SR 518 and cross the causeway bridge. Turn left on Rt. 3, travel 3 miles keeping an eye out for Porcher Road. Turn left. Then turn left again on North Tropical Trail (Porcher Road is poorly marked. If you don’t see it after 3 miles, keep an eye open for N. Tropical Trail. Turn left and back track.) Turn right into Manatee Cove Park, which is well marked. My impression? This trip may not be worth the time. It’s pretty short, even if the whole trip is completed as planned. But there may be a lot more to it than I could see on this trip. SAMSON ISLAND: Directions -Samson Island is south of the campground (Titusville) almost all the way to Melbourne. From Manatee Hammock, head south on US 1 to SR 518. Turn left and cross the causeway bridge at Eau Gallie. Turn left onto Rt. 513 at the first stoplight. After 3/4 miles, turn left on Banana River Drive (It’s Pinetree Drive on the right). 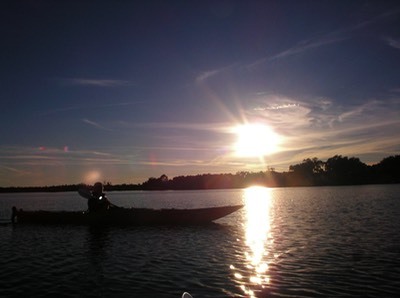 Turn left into Oars and Paddles Park. 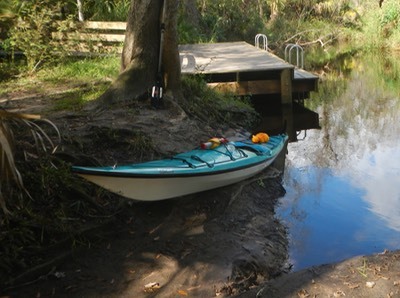 Sunday - we launched off a floating dock into a canal that connects to the Banana River at Oars and Paddles Park. The park lies just east of a large marina and is used primarily as a staging area for high school crew teams. The paddle down the canal was easy and interesting. Then we turned the corner to head north and were confronted with an even stronger headwind. The next three miles were tough on Lisa. 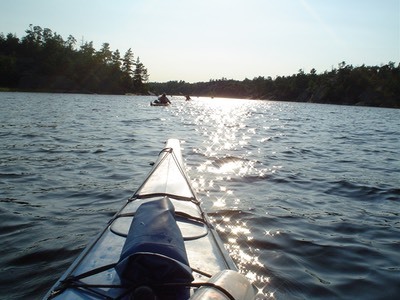 Most of the group was paddling faster and were outdistancing us. One trip leader stayed back with us while the other shepherded the larger, faster group. We were barely making two miles per hour against the headwind, but she refused to quit. 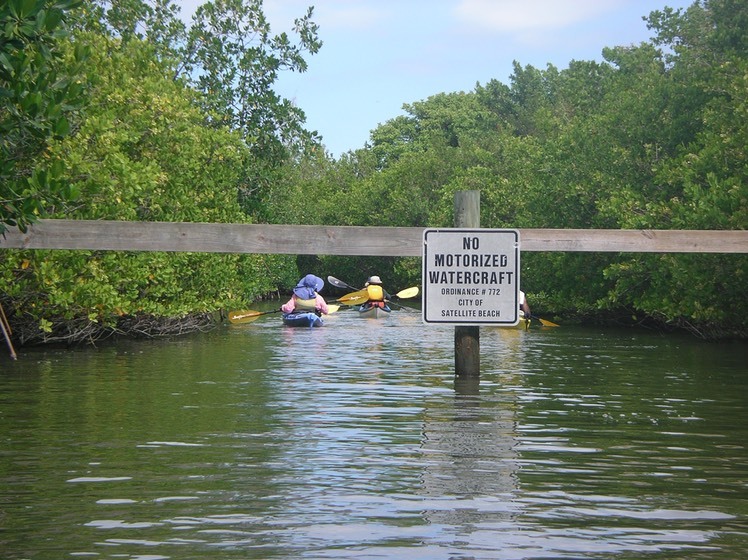 The group waited at a narrow mangrove lined creek, then turned into a short mangrove tunnel where boats started disappearing one at a time through a very narrow opening cut through the mangroves. Behind this narrow landing was a large field, recently cleared of Australian Pines (an invasive species). This was Samson Island. My impression? This might be a great trip, but I can’t tell based on my experience that day. We spent most of our time in canals and rivers surrounded by expensive houses. PINE ISLAND: Directions – From the campground, turn left (south) on US 1 to SR 528 E. Turn left and cross the causeway bridge. Take exit 49 to Rt. 3 N. Go about 5 miles to Pine Island Road. 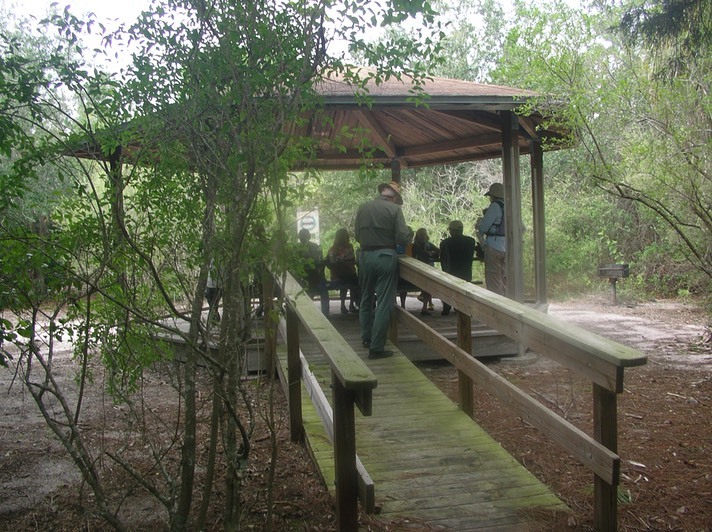 Travel about 2 miles to the Pine Island Conservation Area. Inside the Conservation Area, turn left onto a dirt road and follow it till it ends at Sams Creek. At the end of the dirt road is an open area of grass where both kayakers and canoers, and horseback riders can unload their cars and trailers. What appears to be the desired launch site is visible directly ahead. In fact, we did launch here but soon found that it was a landlocked brackish lake. We pulled the boats out, skirting a small gator in the area, while we tried to figure out where we went wrong. Finally we discovered another launch point invisible behind a locked gate, 150 feet down a grassy path. From a small hill at the side of the put-in we could see dozens of Manatees, surfacing and diving as they fed in this protected opening in Sams Creek. 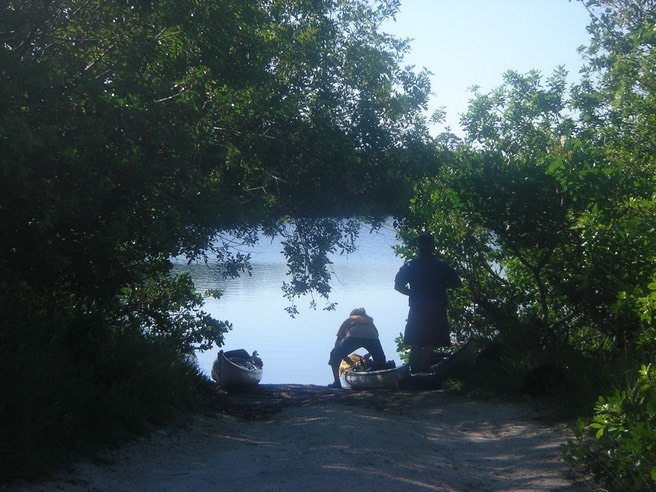 We hurried back to get the boats and portage them over the gate and down the path to the water. What followed was one of the most magical experiences I’ve had, akin to paddling with the Beluga whales in the Saguenay Fjord or swimming with sea lions in the Sea of Cortez. My impression? This was a great trip. It was much more remote than the others and the congregation of manatees was very special. In addition, there appears to be a lot more to explore in this area.